Please consider that although I make software available here free of charge, development and testing can be time consuming and there are also costs associated with maintaining a web presence. If you would like to make a small donation (2.00 GPB - including fees to paypal) towards my time and costs, that would be very much appreciated. Please click the Donate button below. !Split is a RISC OS application which can split large files into smaller chunks for transfer between computers by floppy disk for example. !Split can also join these files back together when they have been transferred. The application is Freeware, and the copyright is held by Adam Hamilton, the author. Adam has kindly given permission for this resource to be available from this web site. The main reason I find this application invaluable is because it is supplied with support executables for other platforms. Note that Split does not attempt to compress, it only splits and rejoins files. I often transfer files from PCs to my RISC OS machines which are larger than a DOS floppy can hold. The support for other platforms come in the form of command line executables. For DOS / Windows PCs, some people would say, Why don't you use WINZIP? My answer to that is, although WINZIP will span archives over floppy disks, the way it achieves this is awkward and slow. My preferred solution is to use WINZIP or similar to compress the large file onto the local hard disk and then split the result for floppy disk transfer. Not telling WINZIP to archive to floppy means it does not have to keep waiting for the floppy disk drive all the time. You compress in one operation and then split. This process also gets around the requirement for a RISC OS program to handle WINZIP spanned archives. You just join files on your RISC OS hard disk and then use SparkFS or similar. I even use the DOS versions at work in preference to WINZIPs spanning solution. Click here to download the full application with support files. I've updated this zip file to include 26/32-Bit RISC OS binaries with permission from Adam. Click here to download my zip archive containing Splitf support files built with StubsG. This program was written by me a long time ago and I recently blew the dust off it, so to speak. It still works under RISC OS 6. What the program does is just sit around in the desktop, waiting for a shutdown request, at which point it displays a shutdown banner window and runs an obey file before it dies. By default this obey file plays a sample (supplied). A long time ago, I found a very slight omission in RISC OS 4, inside the !Configure application. The result of this is that if a RISC OS 4 computer is used at low resolutions with a standard UK TV, then the !Configure Icons don't appear when you load the program. PatchSpr is a little application to work around this issue and provide sprites for low resolution users. This was a first attempt at a Monitor Definition File for a RISC OS 3.5 + computer, which allows the machine to be configured to use a standard UK 50Hz TV (via Scart). This is a simple RISC OS Program for customising the backgound picture on the RISC OS Pinboard. You can specify a whole load of pictures from which the program randomly chooses and it will then change the backdrop picture at regular (configurable) intervals. This is a very simple C Program for placing delays into RISC OS command scripts (Command and Obey files). It allows the calling script or environment to sleep for a number of Centiseconds before continuing. Note that this will actually cause the machine to pause for the duration of the sleep (unless run within a task window) so is only really useful when run in that environment. F_Restart is a small program which will force the RISC OS Task Manager to shutdown without warning other applications and then restart the computer. Written in BASIC, this can be modified to specific user requirements and may be put into the User Library directory to allow it to be called from any other program or obey file (using Filer_Run). Load the BASIC file into an editor to get more information. F_Restart is only compatible with RISC OS 3.5 or Later and has currently been tested only on RISC OS 4.39 and 4.40. If you try this on any other versions please let me know. Note that I've updated this program to prevent requests for insertion of discs at shutdown. Thanks to some friendly advice from someone. This is basically a script wrapped up in an application which tries to collect information about the machine it is running on. The tool is primarilly aimed at those times where people have got a problem with their machine not booting properly or some odd behaviour and want help from the RISC OS community but are not sure what information to gather or how. It is hoped that in such cases those offering support can just suggest that this tool is run and that the output is sent back for analysis. The scripts gather commonly requested information for support of others and can easilly be modified if required. Thanks go out to all those who've suggested improvements and in some cases supplied code. I've had a massive positive response to the release of the application and it has evolved into something quite a bit more complex than I originally expected. Click here to download version 1.14. This is a simple FrontEnd for the popular RISC OS VNC Server written by Henrik Bjerregaard Pedersen and further enhanced by Crispian Daniels, David Llewellyn-Jones and Jeffrey Lee. 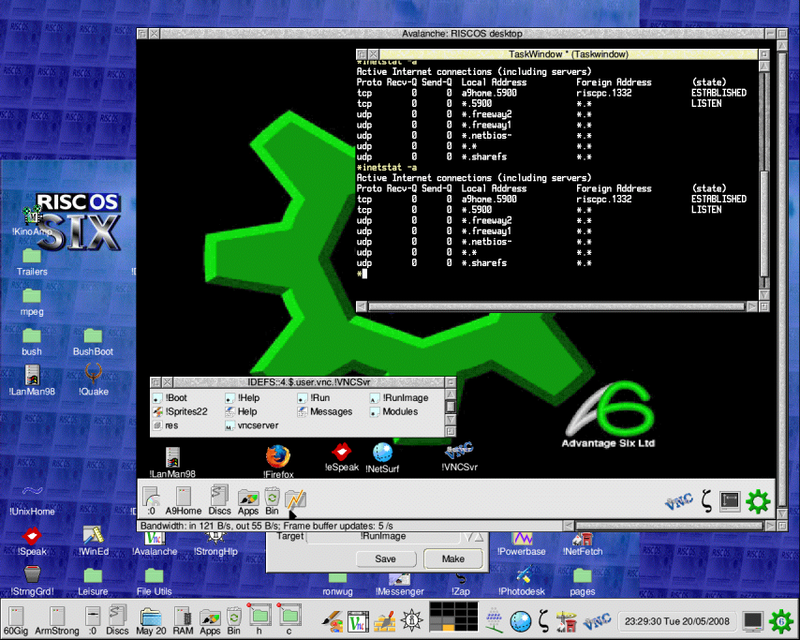 The software is specifically targeted at RISC OS 6.14 or later, though does work well on RISC OS 4.42 on the A9Home. Click here to download version 2.03. Click here to download version 2.05. Below is a screenshot of the server running on my A9Home and being accessed from my Risc PC. This is a simple application which displays the status of the Keyboard LEDs. Click here to download version 0.09. Below are the various submissions I've made to Stuart Tyrrell Developments for their USB MassFS otherdevices support file. If you have any of the devices below, and don&39;t already have these entries, you could copy them into your other devices file inside the !MassFS resource application. Some of these are already in the standard OtherDevs file, but others are newer than the last official release of this file.